– ICTrader is a NSE realtime trading, technical analysis and charting software for NSE India. – Included tools, technical indicators, line studies to make analysis of your stocks in realtime/intraday. – Trading strategies included to generate buy/sell signals automatically in realtime. – Data already integrated for NSE India (Stocks and Index Futures) within the software, so NO external/additional data feed required. – Most active NSE Stocks, Index Futures, active Stock Futures, 18 Nifty Index Options Strike Prices and SENSEX with last 30 days historical intraday data. Multiple Charts. Open any no. of charts up to your system supports. More than 35 technical indicators available.More indicators will added in future. See the trial for available indicators. Advanced Trading Studies, our proprietary studies to produce entry/exit/stop loss levels. Our proprietary studies are created with valuable indicators. Pairs Reversal Trading Strategy with Long/Short/Exit Signals. Trend-I Strategy for Short Swing Traders. Trend Follow for Historical/Positional Trading Signals. Use with EOD Chart. Currently Supports NSE India Real Time Stocks, Index Futures (NIFTY, MINIFTY, BANK NIFTY), S&P CNX Nifty Stock Futures, Nifty Options and SENSEX. 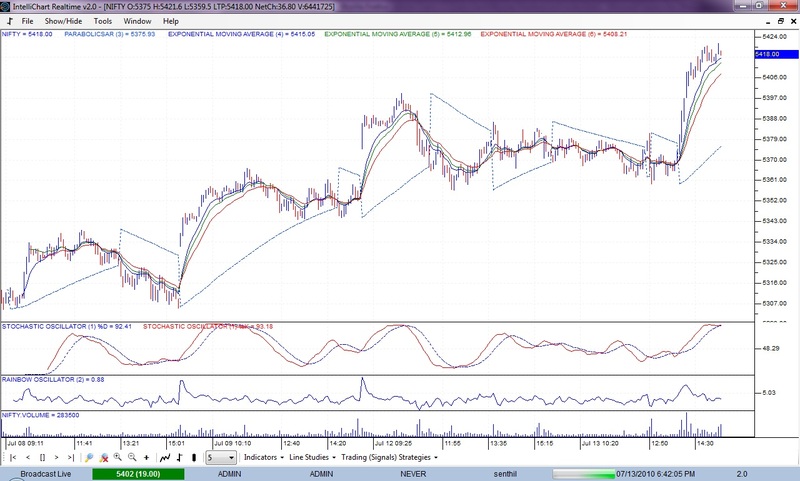 EOD Charts for NSE Stocks. Will soon supports Yahoo Finance, MSN Money and Metastock Realtime & EOD Data Feeds. Available most active stocks, Index Futures and S&P CNX Nifty Future Stocks , Index Options and SENSEX with last 30 days historical intraday data. Please check the service for list of available symbols. please rply me abt the chart and its prices, and how to use these chart, do we arrange the average by using this charts …. Please provide me the cost for this software. i am interested in pairs analysis of F&O segment, does your software support it? please provide trial if you have those features. Interested for ICTrader Realtime v3.2. Please inform how to see live demo & what is the price? does the ictrader works on android smart phone.i trade in nifty future only.